The Canadian military has discharged a soldier suffering from severe depression without a medical release, which means he is not eligible for long-term disability support, re-education, retraining or other benefits. The former captain who served in the Armed Forces for almost 17 years attempted suicide twice and has been diagnosed as having major depressive disorder. Last week, the military released him, citing numerous alcohol-related incidents. Evans says he abused alcohol because he’s suffering from mental illness and wants the military to do a better job of recognizing the toll a soldier’s job can take on their health. He has filed a grievance with the military, a final attempt to have his mental illness fully recognized and get a medical release. “The army has to acknowledge that there are people suffering from mental illness out there,” he says. Go Public asked the Canadian Armed Forces for an interview, but a spokesperson declined our request. We also requested an interview with the head of the Department of National Defence, cabinet minister Harjit Sajjan. Evans pleaded his case to Sajjan in a letter two months ago. No one from Sajjan’s office responded to our emails, so CBC caught up with the minister at a press conference. Later, one of Sajjan’s aides said he couldn’t comment due to privacy reasons. During his time with the military, Evans was involved in numerous drinking incidents, including drinking while driving and assaulting his common-law spouse. 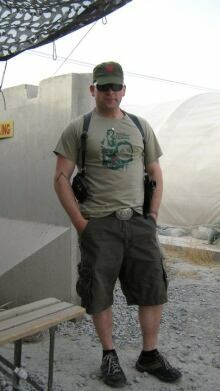 He says working for the military was extremely stressful, particularly the six months he spent in Afghanistan in 2011. 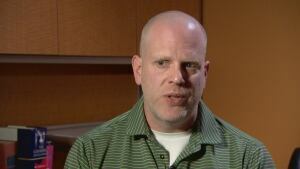 Dr. Curtis Woods, a psychiatrist with Alberta Health Services, diagnosed Evans as having major depressive disorder and alcohol use disorder. “What Colin has experienced is psychological stress that’s been cumulative over time,” says Woods. But Woods says the military doesn’t understand mental illness very well. Woods wants the military to give his patient a medical release to ensure he doesn’t begin drinking again, or possibly harm himself. “I believe that the medical benefits he’s excluded from receiving are actually essential for his further rehabilitation and reintegration,” Woods says. Evans was released under a provision called “not advantageously employable,” after it was ruled he was aware of right and wrong during his misconduct. 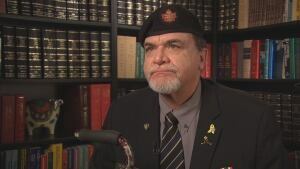 “It’s not a matter, ‘Oh, he knew he shouldn’t drink,'” says Michael Blais, president of Canadian Veterans Advocacy, an organization that lobbies on behalf of military veterans. “What is required is compassion … not discipline,” Blais says. Blais points to a 2014 survey by Statistics Canada that found one in six full-time members of the Canadian Armed Forces had recently experienced mental health or alcohol-related disorders. The survey of about 6,700 regular force members and 1,500 reservists suggested that depression was the most common mental health issue experienced. It also found that one-third of Canada’s soldiers worried that seeking help for mental health issues would harm their career. Blais says that stigma is slowly fading, but the military needs to do more to support soldiers with mental illness. “Because we broke ’em. They didn’t break, we broke them. We put them into an environment where it was traumatic for them, they sustained a mental wound, and as a consequence, we are responsible,” he says. In the federal government’s recent budget, the Liberals promised increased compensation for Canada’s most injured veterans — $5.6 billion over six years to cover costs for veterans currently in the system. 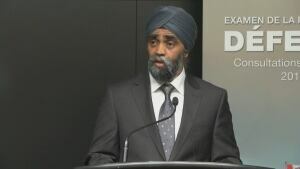 The move was seen as an attempt to improve relations with Canada’s military members, who had a strained relationship with the previous Conservative government. The new money, though, will be allocated to veterans with severe physical disabilities, not for soldiers with mental illness like Evans. 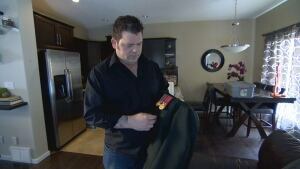 No longer an active member of the military, Evans has returned his uniform and other military belongings, and will soon move from Edmonton back to Saskatoon.